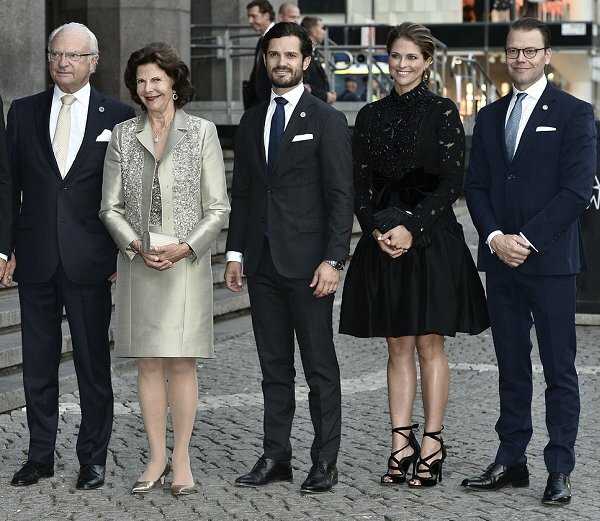 In the evening, King Carl XVI Gustaf, Queen Silvia, Princess Madeleine, Prince Carl Philip and Prince Daniel of Sweden attended a concert by the Royal Stockholm Philharmonic Orchestra at Stockholm Concert Hall to mark the opening of the Parliamentary Session on September 13, 2016 in Stockholm, Sweden. There is no arguing that Princess Madeleine is a gorgeous beauty and in these photos, from the waist up, she is spectacular. But the outfit seems unbalanced, skirt too short, too much knees and legs and the shoes chop her off at the ankles. I don't think anybody's knees are attractive enough to be featured so much. I agree. The shoes are a mistake with such a short skirt. I can't figure out how she walked on the cobblestones! This was not one of Madeleine's best outfits - it makes her look shorter and wider than she actually is. I'd say: Less is more. Not one of the best outfits of Madeline. far too short and wide skirt to be becoming. black is not her color and shoes look very uncomfortable. I should have never seen any of the photos but the first one... But I clicked and... I agree Madeleine looks stunning, from the waist up. The dress is gorgeous but it's too short and that skirt part does not flatter P. Madeleine's otherwise lovely figure. Also, I understand her shoes are killer ones and that she has probably meant to make an impact with them but I can't manage to like them anyway. Maybe with a simpler dress... But this is just too much. Agree with every comment here. Sylvia's skirt length is more elegant, could even be a tad longer. If the dress were floor length and she had a white ruff around her neck, she would be very Elizabethan. Little too much going on. 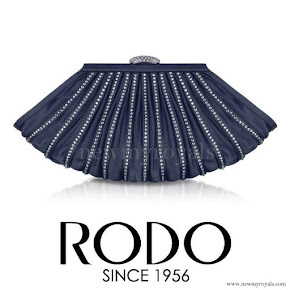 I think the dress that madeleine is wearing is alexander mcqueen. Madeleine ist eine wunderschöne Frau und sie kann alles tragen, manchmal ist sie sehr elegant und manchmal einfach elegant - was soll's. Ich liebe alles an ihr! She looks kind of gothic, It would look better with a longer skirt, as it is it makes her looks a little frumpy. The shoes absolutely don't go with the outfit, a little too much. The Queen looks very elegant, but Princess Madeleine's outfit is a disaster! Maybe if it had stopped at the top, without the giant bow, but the skirt and the shoes all add up to a nightmare.